Sheffield United strengthened their League One play-off chances as Steven Davies's second-half strike earned victory in a thrilling south Yorkshire derby against Doncaster Rovers. Kyle Bennett found the top corner to put Rovers ahead before Jose Baxter levelled from the penalty spot. Matt Done's flicked effort put the Blades ahead but Bennett smashed home a stunning 25-yard strike to make it 2-2. However a superb curled strike from Davies earned the hosts their victory. The visitors did have chances late on, notably when Richie Wellens saw a shot cleared off the line, but they were unable to equalise and are now 10 points off the play-off positions. United stay fifth with five games still to play, but they are eight points clear of Rochdale, who have six games remaining. Match ends, Sheffield United 3, Doncaster Rovers 2. Second Half ends, Sheffield United 3, Doncaster Rovers 2. Attempt saved. Reece Wabara (Doncaster Rovers) right footed shot from outside the box is saved in the bottom right corner. Corner, Doncaster Rovers. Conceded by Mark Howard. Attempt saved. Curtis Main (Doncaster Rovers) header from the centre of the box is saved in the top centre of the goal. Jason Holt (Sheffield United) wins a free kick on the left wing. Enda Stevens (Doncaster Rovers) wins a free kick in the defensive half. Attempt missed. Dean Furman (Doncaster Rovers) right footed shot from outside the box is too high. Corner, Doncaster Rovers. Conceded by John Brayford. Attempt blocked. Curtis Main (Doncaster Rovers) right footed shot from the centre of the box is blocked. Substitution, Doncaster Rovers. Harry Forrester replaces James Coppinger. Substitution, Doncaster Rovers. Jonson Clarke-Harris replaces Nathan Tyson. Substitution, Sheffield United. Craig Alcock replaces Ryan Flynn. Attempt saved. Nathan Tyson (Doncaster Rovers) right footed shot from the right side of the box is saved in the bottom right corner. Goal! Sheffield United 3, Doncaster Rovers 2. Steve Davies (Sheffield United) right footed shot from the right side of the box to the bottom left corner. Assisted by John Brayford. Corner, Sheffield United. Conceded by Enda Stevens. Corner, Sheffield United. Conceded by Andy Butler. Attempt saved. Ryan Flynn (Sheffield United) right footed shot from outside the box is saved in the centre of the goal. Substitution, Sheffield United. Michael Doyle replaces Jose Baxter. Corner, Sheffield United. Conceded by Jamie McCombe. Goal! Sheffield United 2, Doncaster Rovers 2. Kyle Bennett (Doncaster Rovers) right footed shot from outside the box to the top left corner. Enda Stevens (Doncaster Rovers) wins a free kick on the right wing. Goal! Sheffield United 2, Doncaster Rovers 1. 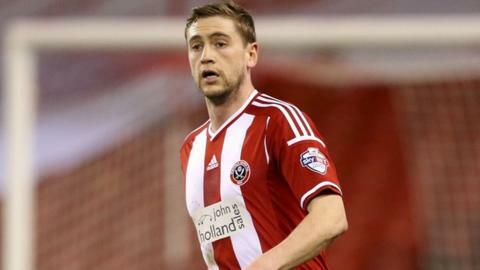 Matt Done (Sheffield United) right footed shot from very close range to the bottom right corner. Assisted by Steve Davies with a cross. Curtis Main (Doncaster Rovers) hits the bar with a right footed shot from the right side of the six yard box. Corner, Doncaster Rovers. Conceded by Chris Basham. Attempt missed. James Coppinger (Doncaster Rovers) right footed shot from the centre of the box is just a bit too high. Attempt blocked. Andy Butler (Doncaster Rovers) header from the centre of the box is blocked. Corner, Doncaster Rovers. Conceded by Jay McEveley. Second Half begins Sheffield United 1, Doncaster Rovers 1. First Half ends, Sheffield United 1, Doncaster Rovers 1.